How to cope with Avoidant Personality Disorder? Avoidant personality disorder (AvPD) is a difficult personality disorder to live with, because of the preoccupation with rejection, fear of criticism and inadequacy, insecurity about one’s physical appearance, and sometimes feelings of inferiority. It is these fears and insecurities that make coping with avoidant personality disorder such a struggle, and not only for the person with AvPD: friends, relatives, and romantic partners often suffer as well. For instance before or during social situations as these are often very stressful and likely to be avoided by the person with AvPD. This page discusses the avoidant personality disorder symptoms, strategies and exercises to reduce these symptoms, and makes sure that coping with avoidant personality disorder becomes easier for those suffering from AvPD. This page does not directly focus on the difficulty people with AvPD have with making decisions, because the other exercises will already help someone with AvPD to become more confident of their own skills, thoughts, and appearance. It is easier for someone with AvPD to make decisions when their confidence levels increase. Possible causes of avoidant PD. This page starts with the fourth AvPD symptom, because this symptom often leads to the avoidance mentioned in symptom A1 and A7. Coping with avoidant personality disorder starts here. Symptom A4 is all about the preoccupation with being criticized or rejected in social situations. This can cause someone with avoidant personality disorder to be more withdrawn in social situations, which could lead to less social interaction and feelings of not fitting in. Being criticized or rejected in social situations does not equal being rejected as a person. Criticism and rejection are always subjective and context related. For instance, in a group of religious people an atheist may be criticized or rejected. It is very likely that this atheist is being criticized or rejected for his views on religion, but not for anything else. This same atheist will not be rejected or criticized for his views on religion in a group of atheists. In other words, always use the right context and realize that the criticism comes from an individual and is, therefore, subjective. Someone can experience difficulties with criticism from a particular group of people, but it is also possible someone has more problems with criticism on a certain topic. Religion, for instance, may be a more difficult topic to Maria compared to John. An interesting question is, of course, why does one topic affect you more than another? And how can you do about it? What can you do about this fear of criticism and social rejection? Write down 20 random things about yourself: eye color, favorite music, how you like your coffee/tea best, things you (dis)like about others, and so on. This is a pretty long list. Categorize these things about yourself in four categories according to how important they are to you. Take the thickest book you can find. Observe the amount of chapters, paragraphs, sentences, words, and letters. Take your categorized list and count the things in the least important category. Each of them represents 1 letter in the book. The second category represents a word, the third a sentence, the fourth (the most important category) a paragraph. Imagine that this book is you and that each letter in the book says something about you. Each word, each sentence, each paragraph, and so on… Now use your list and count the amount of letter, words, sentences, and paragraphs and mark them in your book. Do you see how much of the book is still not marked? Do you realize how small (in comparison to the whole book) your list now is? This exercise can also be done with criticism and insecurities about yourself: write down a list of 20 insecurities about yourself and follow the rest of the instructions. 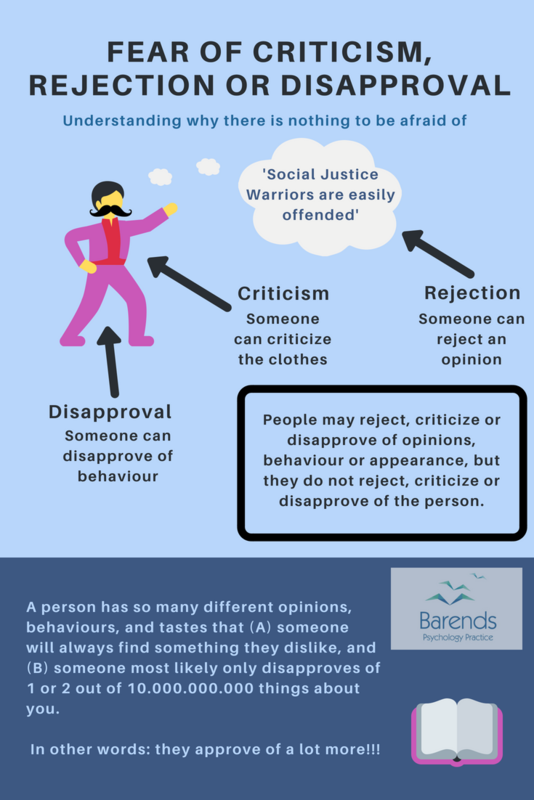 It can be quite difficult to receive criticism on a certain topic, or to feel rejected or disapproved of a certain personal view. Sharing that view or talking about that topic may be more difficult for you, compared to talking about other topics. A good way to reduce the impact of possible rejection, criticism or disapproval on certain topics, is by practicing conversations about these topics with your partner. With regards to coping with avoidant personality disorder, exposing yourself in a controlled way helps you to get used to certain situations and reduces the fear of possible criticism, disapproval or rejection. Remember: it is just an exercise! Sit down with your partner and explain to him or her why this topic is so important for you. It is important for your partner to be open minded and not judgmental. The next step is to discuss which responses would make you feel very uncomfortable and why. Rate these responses on a 0-10 scale (10 being as upsetting as possible). The next step involves talking about this topic during a role-play. Your partner will adopt the least upsetting response on the list. This will trigger some of your feelings of discomfort. It is important to continue to talk about this topic until this uncomfortable feeling disappears. It is important for your partner to respond gentle and to not push it. After all, it is just an exercise. After the conversation it is important to analyse the conversation: how did it go? What was the most difficult part in the conversation? And most importantly: did the uncomfortable feeling become less strong eventually? If it was difficult for you to discuss this topic because of your partner’s response, it may help to find alternative answers to his comments and practice these. In the end, practice makes perfect and boosts your self-esteem. Ideally, you and your partner will have more conversations about this topic and your partner takes a more upsetting response each time (but only when you are ready for it). This symptom focuses more on rejection. Someone with AvPD does not want to get involved with people unless he or she is certain of being liked. Possible rejection causes a lot of fear and stress in people with AvPD, which makes attending social situations very difficult if not impossible. People with AvPD are preoccupied with the fear of rejection. This fear of possible rejection makes people with AvPD pay extra attention to signs of rejection in the behaviours of others , which is called attentional bias. 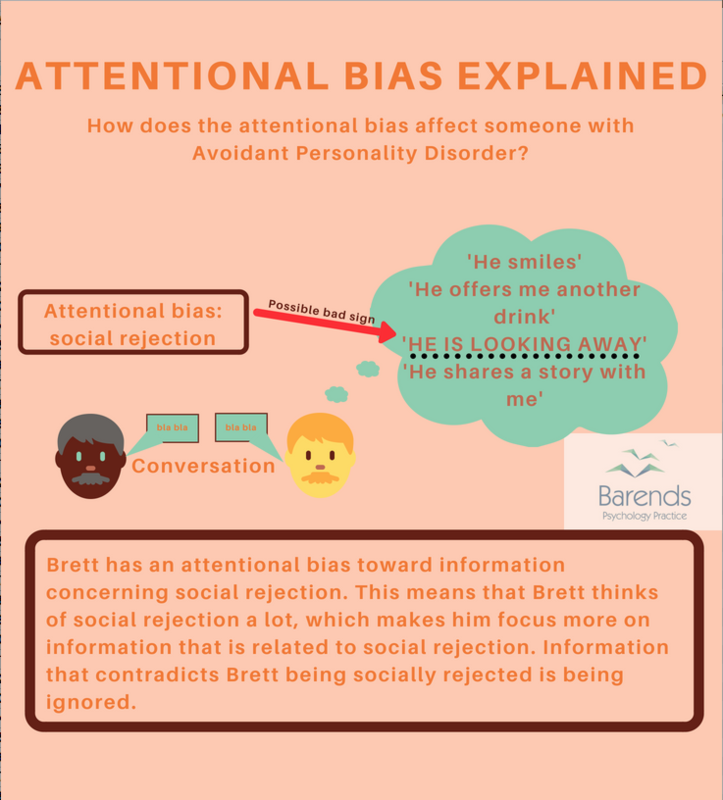 The attentional bias makes it more difficult for people with AvPD to focus on other information (information that contradicts their fear of rejection). This leads to the false belief that people, indeed, show signs of rejection, which increases the avoidant personality disorder symptoms. In the image to the right or above you can see what happens with Brett’s thoughts; he has several thoughts during a conversation with someone, but only the negative thought catches his attention. For people without AvPD this thought is simply one of many and not alarming. For the person with AvPD, however, this is a very alarming thought and will produce feelings of insecurity and inadequacy. These negative feelings will likely negatively affect the conversation (Brett does not know what to say or how to keep the conversation going, he may stutter or blush, and eventually the conversation comes to an end, which confirms Brett’s fear of rejection). In other words, coping with avoidant personality disorder is more difficult due to the attentional bias. This exercise is only meant for those people who have mild/moderate Avoidant Personality Disorder. During an encounter with someone, count all the positive, neutral, and negative signs someone sends out. Right after the encounter, write them down on paper or create a note in your phone. Categorize them according to your interpretation: positive, neutral, negative. Discuss this list with your friend, partner, relative or therapist and ask them whether or not they agree with your list. Discuss the social encounter with the friend, partner, relative or therapist to see if you missed some signs or need to interpret them differently. Merge the positive and neutral signs list. Count the signs in the positive/neutral category and compare them with the amount of signs in the negative category. It will be clear that there are more neutral/positive signs someone sends out compared to negative signs. Ask yourself the question: do I reject someone over one or two things I dislike about the other person, even if there are a lot more neutral to positive things about that person? The answer to this question is most likely: No. Do you think someone else would reject another person over one or two things they dislike about that person, even if there are a lot more neutral to positive things about that person? Exercise 3 helps people to focus more on the neutral to positive signs. By putting more emphasis on the neutral to positive signs, it is likely that the attentional bias towards social rejection will become less strong. The following exercise focuses more on the power the negative signs have and aims of reducing their significance. Write down what the worst fear is regarding social rejection (for instance: people find me boring/unappealing). Write down what the worst consequence is if this worst fear comes true (for instance: people will avoid talking to me). During a social situation, engage in one or more conversations and remember the people you spoke to. During a new social situation, test the hypothesis that people find you boring/unappealing by checking if your worst fear (people will avoid talking to me) comes true. If people do not avoid you in an obvious way and still talk to you (it doesn’t matter if you start the conversation or not), then your hypothesis is incorrect. If the hypothesis is incorrect, it means that people do not find you boring/unappealing when you talk to them. NOTE: getting to the core of your fears can be really difficult and the help of a professional is often recommended. Most people with AvPD get stuck on the fear: people find me boring/unappealing. <– this is difficult to test and also not your biggest fear. The biggest fear most likely is that people do not want to talk to you or that you will be ignored at parties. <– this fear is much easier to test. By practicing a lot with these exercises, coping with avoidant personality disorder becomes a lot easier. How can your partner be of help? By observing the people your partner is having a conversation with, you can count the possible signs of rejection in the people your partner is talking to. Ideally, you would not participate in the conversation and just observe the way these people respond to your partner, their non-verbal behaviour, and how much they engage in conversation. Even in conversation with good friends, you may notice some possible signs of rejection. This is pretty normal in conversations and most likely a misinterpretation on your end. For instance, when someone passes holding a beer, your partner’s conversation partner may be distracted because of the beer and desire one himself. This distraction has nothing to do with a possible rejection of the conversation. Do not participate in a conversation your partner is having with a group of friends or with just one friend. Simply observe. Remember the amount of possible signs of rejection. Signs that would make you feel bad about yourself if you noticed them in the person you talk to. Also count the signs if your partner is talking to good friends. After the conversation, ask your partner about his opinion on the conversation and if he noticed any possible signs of rejection. Find alternative explanations for these possible signs. These explanations should have nothing to do with rejection. Observe during the same event or future events if these people will talk to your partner again. If this is the case, then it should become clear that the signs you identify as indicating possible rejection are not signs that indicate possible rejection at all. By observing your partner and by looking at his behaviour and overall feeling after the conversation, you create a reference. The more often observe that certain signs in fact do not mean possible rejection, the easier it will become to ignore these signals during your own conversations. The third symptom focuses more on insecurity. The fear of being shamed or ridiculed causes someone with avoidant personality disorder to show restraint in intimate relationships. Being insecure about your physical appearance or performance in bed are among the more common insecurities. More often than not, these insecurities developed after a traumatic incident where they were shamed, ridiculed or made fun of. A common response is to avoid doing or showing what you are most insecure about. In case you wonder whether you experienced something traumatic and if this traumatic event is still bothering you, we recommend you to take the online PTSD test. This test is anonymous, free, and only takes 3 minutes of your time. In relationships it is important to be transparent and honest. Talk to your partner about your insecurities and set up a plan to do something about it. Sometimes this means working out or practicing more, but in most cases the partner has a completely different view of you than you have of yourself. Apply exercise 1 in your relationship as well, and ask your partner to create a small list (10 items) of things he or she likes about you. The less superficial they are, the better. For some people with avoidant personality disorder it is difficult to show their partners that they are crazy about them. Saying ‘I love you’ can be a huge challenge already, as well as giving your partner a kiss on the mouth in public. Although you would like to do these things, there is an irrational fear holding you back. ‘What if my kisses are not being appreciated?’, ‘What if the timing is not right and she doesn’t take it well or hear me?’. If these things are indeed difficult to you, please mention this to your partner, because your partner can become insecure or grow frustrated. Create a list of 10 behaviours, gestures, or words that express your fondness/love of your partner. Rate them on a 0-10 scale (10 being as scary/difficult as possible). Share this list with your partner. Your partner needs to be informed about this, because he or she needs to be able to respond in a normal/positive way. For your partner: remember that what may seem normal to you is actually very difficult for your partner. With the right response you encourage him to do it more often. Coping with avoidant personality disorder is something you do together. Start with the item which carries the least anxiety and find a proper moment. For your partner: respond to his/her gesture, behaviour, words in a positive way. Once you feel completely comfortable with this item you move up to a more difficult item. The more you practice, the easier it gets. Be aware: your partner cannot always respond as positive as he or she is doing nowadays. The moment you get insecure, ask your partner for some reassurance. Another good exercise to improve the relationship: hug each other twice a day until the both of you are completely calm. This is a planned action and can take between 3 minutes and 15 minutes, depending on the amount of stress someone experienced that day. Discuss two moments during the day on which the both of you can hug each other. Some couples prefer in bed in the morning or in the evening. Also, discuss a sentence or word to signal that you are completely calm so the other person is aware of that. Hug each other. Do not look on your phone in the mean time. Allow yourself to feel your partner’s hug. You are allowed to ask your partner about their day. This is a great moment to talk a little. Some prefer silence, however. You are allowed to exchange a kiss, of course. Repeat this exercise every day. Symptoms A1 and A7 are all about avoidance: avoiding occupational activities that involve significant interpersonal contact (symptom A1) and a reluctance to take any personal risk or to participate in new activities out of fear of embarrassment (symptom A7). Someone with AvPD avoids interpersonal contact or new activities, because they fear criticism, disapproval, rejection or embarrassment. Giving a speech, having drinks with coworkers after work or attending a birthday party of coworkers causes someone with avoidant personality disorder a lot of stress and worry: ‘what if they don’t like me?’, ‘what if they find me boring?’. The stress and worry often becomes so severe that someone with AvPD will decline an invitation or comes up with an excuse to not have to give the speech. Unfortunately, avoiding interpersonal situations takes away a chance for someone with AvPD to experience that their fears are not true. On top of this missed chance, their fear of interpersonal situations will increase. If this fear of rejection, disapproval or criticism is the result of a traumatic event, then please reach out to a professional for PTSD treatment. PTSD treatment reduces the above mentioned fears significantly. 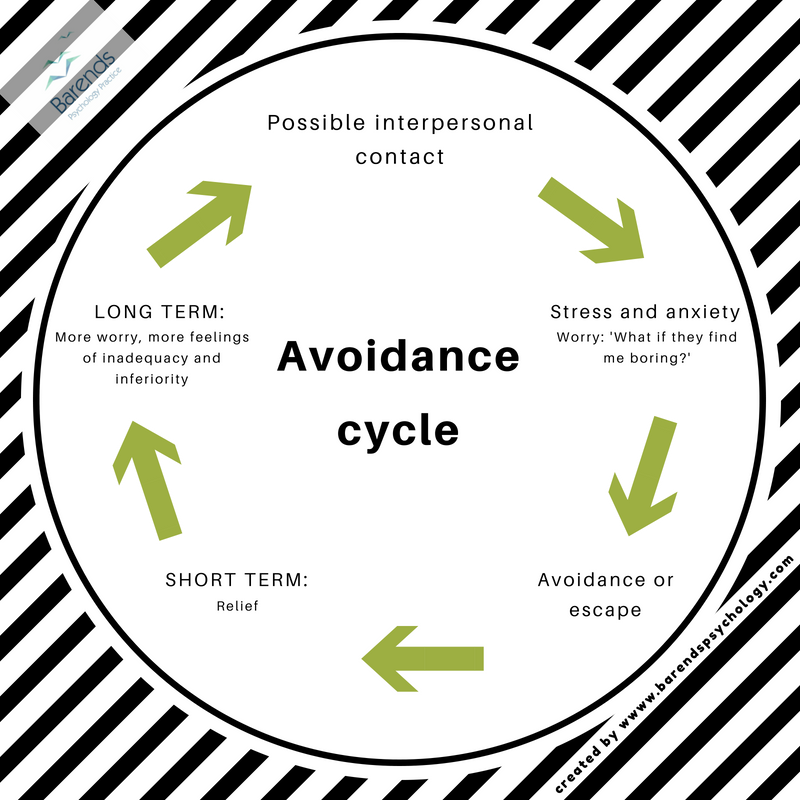 Coping with avoidant personality disorder in an effective way can only be done if the person is willing to break the vicious cycle of avoidance. Exposing yourself to interpersonal contact or new activities is scary and stressful, but also rewarding once you know what to pay attention to and how to deal with ambivalent verbal or nonverbal signs of the people around you. The exercises on this page will help you to get through these stressful situations. A safety sign is any object or person that helps you calm down when you are stressed or anxious. A safety behaviour is any ritual or behaviour that helps you calm down when you are stressed or anxious. A lot of people use safety signs and behaviours to make it through a certain situation. Alcohol, for instance, is an often used safety sign during social events. People often feel more relaxed when they had a beer or a wine; it is easier for them to engage in conversations. For others, hanging garlic in the window helps them calm down. Pick 5 social or public situations you prefer to avoid or that typically induce a lot of stress or anxiety in you. Write down why you prefer to avoid them. Think of something or someone you can take with you that calms you down. For some this is a necklace or deodorant, whereas for others this is their partner or best friend. Take this person or item with you during these situations and use the fact that you are calmer than without these safety objects or behaviours to practice with one of the exercises on this page. It is easier for people to practice or observe others when they are calm. The exercises on this page will help you to feel more comfortable in social situations, and will reduce the AvPD symptoms. Once you notice that you are doing better, consider leaving the safety object or person home during one of the social or public events. This may increase stress and anxiety levels in the beginning, but this is temporary. This symptom is more about feelings of inadequacy. Someone with AvPD often wrongly thinks he or she is not interesting enough. They have a feeling that their performances are not noteworthy or that their interests are not shared by others. In the above mentioned exercise 4, you already experienced that people will not avoid you and therefore do not believe you are uninteresting or unappealing. However, for the sake of the following exercise, we’ll assume your interests are limited and you may lack interesting conversing topics. Pick a topic that the news covers a lot these days (for instance Global warming). Get familiar with the terms and definitions used. Search the Internet for in-dept articles from renown websites or journalists and read them. Search the Internet for alternative views on the same topic and read them as well. Adopt a popular view or a view you support the most. When there is a social situation and this topic comes up, you can join in. It takes two to four weeks to get acquainted with a topic. Once you’ve sufficiently read into the topic, you can move on to a new topic. In a year from now you will be acquainted with at least 12 interesting topics. Knowing about more topics boosts your confidence levels, makes it easier to participate in conversations, and increases the chance of receiving positive feedback from others. This may be the easiest exercise to follow for those who are coping with avoidant personality disorder. Symptom A6 is more about feeling unappealing, socially inept or inferior to others. These feelings often produce a preoccupation with ones appearance (physically or verbally). A preoccupation with ones own behaviour can easily lead to unnatural behaviours which can make someone feel even more socially inept, unappealing or inferior to others. Especially when the person analyses their own performance after an event, they often feel more unappealing, inept or inferior. People with avoidant personality disorder may use the confirmation bias to find evidence for their inferiority to others and social ineptness. Someone with a confirmation bias looks for evidence that supports their current belief about something. Someone who feels inferior to others will look for evidence that shows that they are indeed inferior to others, while they will ignore evidence stating the opposite. 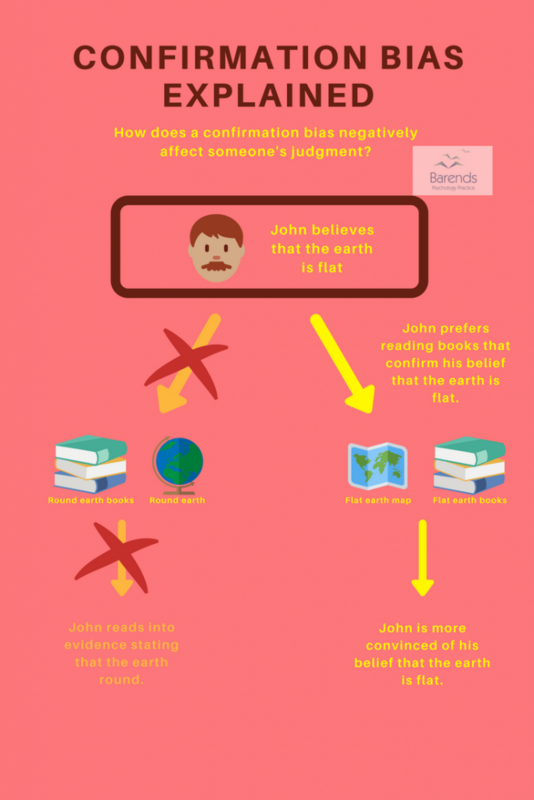 In the image above or to the right we illustrated the confirmation bias in a very simple way. In other words: coping with avoidant personality disorder is negatively affected by the confirmation bias. Go back to exercise 4 and read the old fear and hypothesis. In our example these were: ‘people find me boring/unappealing’ and ‘people will avoid talking to me’. Create a new hypothesis by transforming the old one into something positive. In our example it will become: ‘people find me interesting/appealing’ and one way to test this is to see whether or not people want to talk to me. During social situations, remind yourself several times of the new hypothesis. Look for evidence that confirms this hypothesis. NOTE: in the beginning it will be difficult to focus on positive signs, because there is a confirmation bias stating that you are unappealing/boring. However, with a lot of practice and conscious effort, you will notice that it becomes easier to focus on positive signs. At the same time, try to ignore the negative signs/thoughts by distracting yourself if they pop up. This way you can’t give these negative thoughts and signs attention and that decreases their impact on your mood. By now, you should see signs that coping with avoidant personality disorder is not that difficult. Li, H., Zeigler-Hill, V., Yang, J., Jia, L., Xiao, X., Luo, J., & Zhang, Q. (2012). Low self-esteem and the neural basis of attentional bias for social rejection cues: Evidence from the N2pc ERP component. Personality and Individual Differences, 53, 947-951.